The 2017 edition of Anuga, the world’s largest food fair in Cologne, has come and gone this past week, with the organisers, KoelnMesse, claiming that this, the 34th Anuga, was the best trade fair in a long time for many of the exhibitors. More than 7,400 companies from 107 countries, a new record, presented products from all over the world and all categories over the course of five days. Around 165,000 trade visitors from 198 countries took advantage of this unique offer for sourcing, information and ordering at top level. “Anuga is the world’s biggest and most important business platform for the international food industry,” Gerald Böse, President and CEO of Koelnmesse, commented towards the end of the event. While much of the food and drinks business at Anuga is straightforward, many exhibitors use it as to tickle the taste buds of tomorrow. For many visitors, hunting out F&B trends, as well as the new, novel and innovative is a key reason to visit Anuga’s massive halls (284,000m2!). Here are but some NPD trends at the show, as outlined by Innova Market Insights…. The meat industry is having to be particularly careful and thorough in how it presents a strong sourcing and origin message. A quality and traceability story was strongly prevalent at this year’s Anuga meat halls. Meat innovators are also differentiating themselves on a snacking platform through the use of on-trend packaging, and unusual ingredients. Puigrenier SAS offered The Meat Cellar, based on a unique process of dry-aged beef. The natural process helps the organoleptic qualities of the meat and its preservation. Big Al’s Prime Burger is made using prime cuts of Irish-sourced beef, which allows for a premium burger that responds to gourmet demands. The Hamburger from Hamburg is based on traditional burger patties made in Hamburg. Only meat from German heifers is used, which is rounded off with a pinch of salt and pepper. Pop Bugs (above) are a new snack product from Micarna, a Swiss food company, made of crickets. 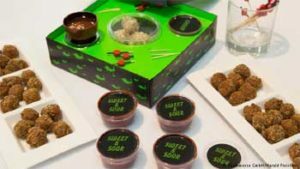 The fair’s innovation showcase presented some 67 products and concepts, many of which offered alternatives to animal rearing — from vegan “tuna” to these crickets dipped in snack sauce. Organic foods have much more than niche appeal. Many players are benefiting from the advantage that comes from being able to tell a unique sourcing story. The incorporation of ancient grains and the benefits of a raw and paleo positioning are just two differentiation platforms within this dynamic space. Q-Organic offered Q-Shake – Quinoa Shake Powder. The basis for their Q-Shakes is Peruvian quinoa, the power grain of the Incas and a natural source of all eight essential amino acids. 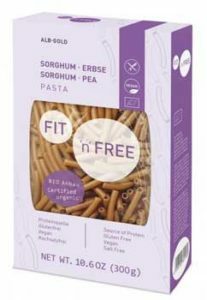 ALB-GOLD Teigwaren has launched FIT ‘n’ FREE Organic Sorghum & Yellow Pea Pasta (left), which completes the current legume pasta assortment of red lentil, chickpea, and buckwheat fusilli. Max Sport presented Raw Paleo Protein, a blend of fruits, nuts, seeds and proteins processed below 42°C to keep all the enzymes, vitamins, minerals and other benefits untouched. Verival Vita+ Naturprodukte has launched Organic Date & Coconut Bites. The vegan date snack is made exclusively from two ingredients: sun-ripened, sweet dates are processed into a mass and rolled into coconut flakes. Probios Spa has launched Pulses Chips, a brand new 100% pulses chips line. Not fried, and made with sunflower seed oil only, the products are palm oil free. An origin or sourcing story is a great way to stand out on the beverage aisle. The rise of the craft beverage trend has given a marketing boost to small innovators and forced a rethink at some of the big boys. Natural functional beverages, including healthier alternatives to standard energy drinks and stevia-sweetened beverages were also clearly on display at this year’s Drinks hall. Sparkling Coconut Water 100%, a pure coconut water (Namhom coconut) that is slightly carbonated. Brooklyn Crafted Sugar-Free Ginger Beer is the company’s sugar-free ginger beer sweetened with organic stevia leaf. McCarter offered Body&Future functional plant milk drinks (left). 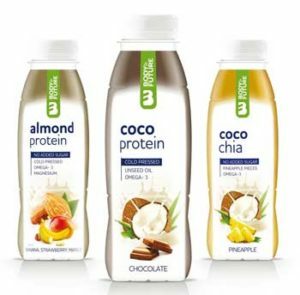 The company claims to be opening up a category of functional vegetable milks with fresh pressed juices or purée, plant proteins and other health ingredients. CHAi BiRDS is the first in the line of healthy, powerful teas combined with other natural superfoods: ginger, mint and lime. GLSA offered Give It a Shot under the So Natural brand of HPP juices. The new shots allow the consumer to start their day with the best nutrients and vitamins. honeyB is claimed to be the world’s first sparkling honey drink. Healthy snacking was strongly on-trend at this year’s event. Adding vegetables and ancient grains is particularly prevalent in the Bread & Bakery hall. But indulgence also remains strong with key innovations including the marriage of a croissant and a muffin. Boboli Benelux has launched Veggies Healthy Bread, that are contemporary and colourful breads, based on vegetables. Prestige-96 AD offered Frunu Fruit&Nut Roll, a 100% natural products that is packed with fruits, nuts and spices. Each FRUNU Roll is made from only 5 ingredients. 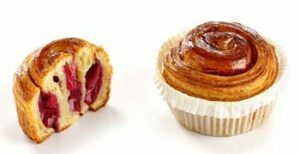 La Lorraine presented Cruffin Red Fruit (above), promoted as an original marriage of a croissant and a muffin. Didn’t get to Anuga? You can still tap into all the innovation! 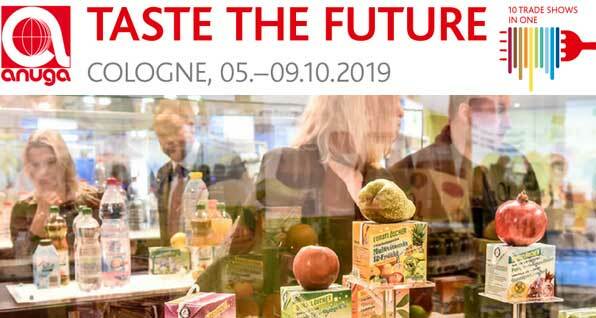 KoelnMesse has an excellent Anuga website, and you can access/download all the listed new products at the expo, as well as all those selected to be part of its innovation Anuga Taste exhibition.